You are a window cleaner. Maybe you have had problems with clients about payment, or about cleaning inaccessible places or blame for things that should not be your fault. This simple contract will protect you. You can add anything extra that you need to have in writing but we have tried to cover the most important issues. 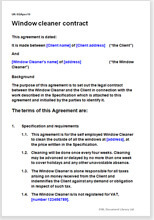 Just add specification for actual window cleaning work. Private clients will not be happy to be offered a ten page legalistic document. This contract has been drawn to be sufficiently “unthreatening” as to enable you to obtain a client’s signature without delay or apology. As a window cleaner, you need protection. If you have not arranged for up front payment you are always at risk that your client will not pay. We give you the option of several alternative payment procedures from all up front to all on credit. Limitation of liability also features large in this contract. "Fantastic documents. I actually understand every word!" "We design professional websites and use Net Lawman documents to provide the best possible service to our clients."